Documents show that the N.S.A. has been waging a war against encryption using a battery of methods that include working with industry to weaken encryption standards, making design changes to cryptographic software, and pushing international encryption standards it knows it can break. 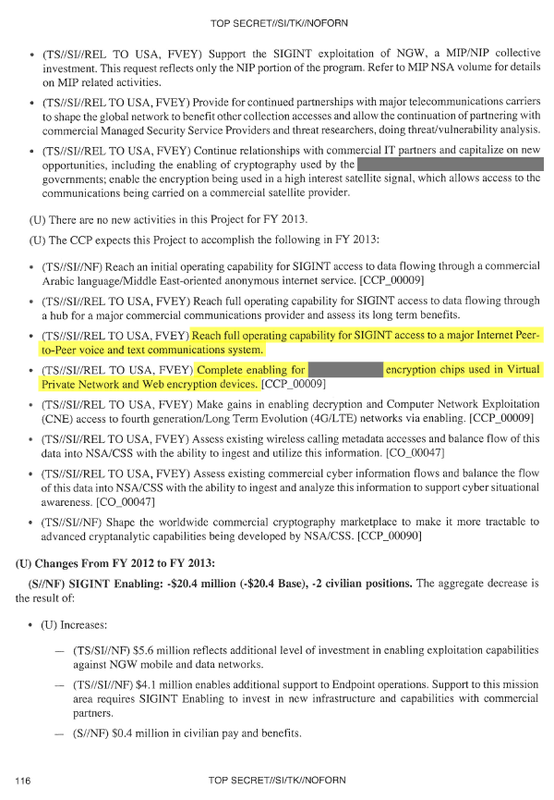 This excerpt from the N.S.A.’s 2013 budget request outlines the ways in which the agency circumvents the encryption protection of everyday Internet communications. 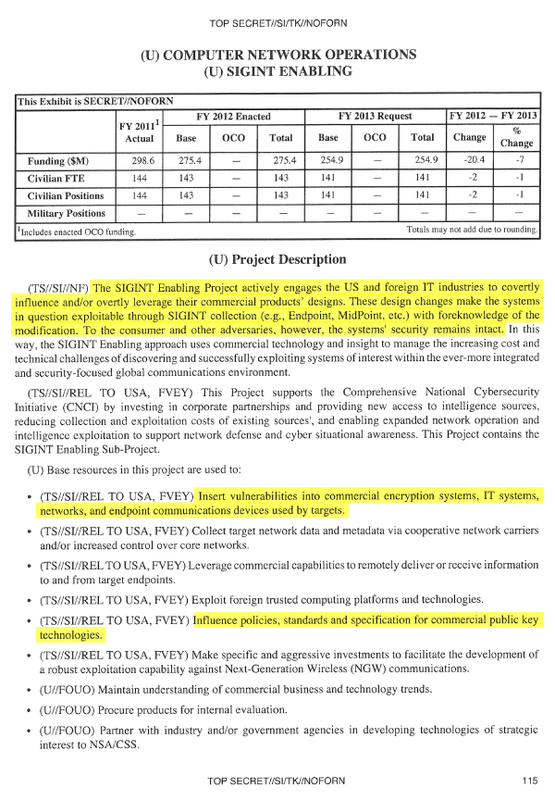 The Sigint Enabling Project involves industry relationships, clandestine changes to commercial software to weaken encryption, and lobbying for encryption standards it can crack. The N.S.A. 's Sigint Enabling Project is a $250 million-a-year program that works with Internet companies to weaken privacy by inserting back doors into encryption products. This excerpt from a 2013 budget proposal outlines some methods the agency uses to undermine encryption used by the public. The agency works with companies to insert back doors into the commercial products. These back doors allow the agency, and in theory only the agency, to gain access to scrambled information that it would not be able to view otherwise. Because the N.S.A. has long been considered the world's top authority on encryption, it has dual, sometimes competing, roles. One responsibility of the agency is to safeguard United States communications by promoting encryption standards, and the other is to break codes protecting foreign communications. Part of the Sigint Enabling Project's goal is to influence these standards — which are often used by American companies — and weaken them. The agency defines capability as “the NSA/CSS ability to exploit a specific technology,” according to a 2010 document outlining the Bullrun program. Here, the agency is claiming that it can gain access to the text and audio of an Internet chat service. It is unclear from the documents that The New York Times and ProPublica have access to which service this document refers to. Large Internet companies use dedicated hardware to scramble traffic before it is sent. In 2013, the agency planned to be able to decode traffic that was encoded by one of these two encryption chips, either by working with the manufacturers of the chips to insert back doors or by exploiting a security flaw in the chips' design. 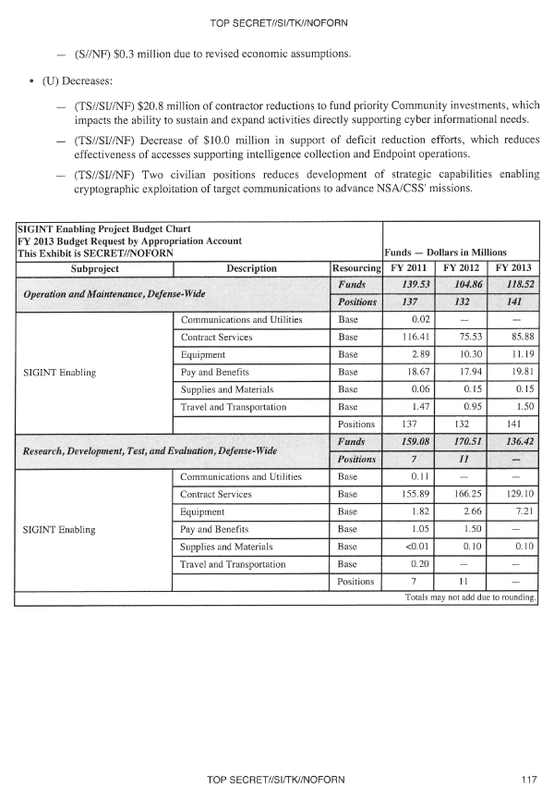 When British analysts were cleared for the Bullrun program, they were given this briefing sheet outlining the sensitivities of the program, including the N.S.A. 's specific capabilities against widely used Internet encryption technologies. 1. The ability to exploit targets’ encrypted communications is extremely fragile and is often enabled through sensitive ECI programmes. The need to take additional measures to protect that capability has long been recognised. Currently, virtually all decryption is carried out by PTD (ARTHUR) processing with decrypts going to the IIB in the NOCON CoI; some decrypts are placed in the ENDUE CoI due to the sensitivity or fragility of the exploitation capability. 2. In recent years there has been an aggressive effort, lead by NSA, to make major improvements in defeating network security and privacy involving multiple sources and methods, all of which are extremely sensitive and fragile. These include: Computer Network Exploitation (CNE); collaboration with other Intelligence Agencies; investment in high-performance computers; and development of advanced mathematical techniques. Several ECI compartments may apply to the specific sources, methods, and techniques involved. 3. Making the best use of these new capabilities requires that decryption processing be widely deployed beyond PTD and the results of that processing be available to a wide range of analysts. This inevitably makes it harder to protect this sensitive and fragile capability and we need to counterbalance this by introducing measures to control access to this material and heighten awareness of the sensitivities amongst those who have access. 5. The BULLRUN CoI is owned by ■■■■■ for Penetrating Target Defences (PTD). Authority to manage the CoI is delegated to ■■■■■ (currently■■■■■) and ■■■■■ (■■■■■, currently ■■■■■). 6. It is imperative to protect the fact that GCHQ, NSA and their Sigint partners have capabilities against specific network security technologies as well as the number and scope of successes. These capabilities are among the Sigint community’s most fragile, and the inadvertent disclosure of the simple “fact of” could alert the adversary and result in immediate loss of the capability. Consequently, any admission of “fact of” a capability to defeat encryption used in specific network communication technologies or disclosure of details relating to that capability must be protected by the BULLRUN COI and restricted to those specifically indoctrinated for BULLRUN. The various types of security covered by BULLRUN include, but are not limited to, TLS/SSL, https (e.g. webmail), SSH, encrypted chat, VPNs and encrypted VOIP. The specific instances of these technologies that can be exploited will be published in a separate Annexe (available to BULLRUN indoctrinated staff). 7. In addition to the specific technologies that GCHQ or its Sigint partners are able to exploit, the methods used to achieve the exploitation must also be protected. These include support from other organisations, both internal and external to GCHQ. Access to BULLRUN does NOT imply any “need-to-know” the details of sources and methods used to achieve exploitation and, in general, there will be NO “need-to-know”. Requests for access to information on sources and methods should be sent to OPC-SEC; if considered appropriate, this access may require clearance for certain ECIs. 8. BULLRUN material, data, and details must be protected with the use of the BULLRUN CoI and be marked with the label “BULLRUN,” in addition to the required privacy marking and other descriptors. Use of the BULLRUN marking is restricted to GCHQ and its Sigint 2nd Parties. 9. Requests for access to the CoI must be sponsored by a GC8 or above and must be accompanied by a business case outlining the “need-to-know”. Access for contractors will be limited and will require a strong business case; such requests should be discussed with the CoI Authority’s delegates before submission. Requests for access are to be sent by email to PTDAccesses. 10. Knowledge of BULLRUN information and access to the BULLRUN CoI will only be granted to indoctrinated individuals. 11. It is the responsibility of sponsors (or their successors) to notify ■■■■■when an individual no longer require access to BULLRUN. 12. Owners of BULLRUN materials are responsible for correctly marking the information and for ensuring that it is handled according to guidelines for protecting classified or COI information. 13. Reports derived from BULLRUN material shall not reveal (or imply) that the source data was decrypted. The network communication technology that carried the communication should not be revealed. 14. Further dissemination, other than in product reports, of any data or information derived from BULLRUN data must be thoroughly justified and receive prior approval from ■■■■■. 15. All questions or concerns regarding BULLRUN material and information should be directed to ■■■■■. The following offers some guidance on Protective Markings (PM) for BULLRUN material. Questions regarding PMs can be directed to the CoI Authority’s delegates. The fact that GCHQ has unspecified capabilities against network security technologies eg TLS/SSL, HTTPS, SSH, VPNs, IPSec. NB capability does not necessarily equate to decryption capability. The fact that GCHQ or its 2nd Party partners has some capability against the encryption used in a class or type of network communications technology. For example, VPNs, IPSec, TSL/SSL, HTTPS, SSH, encrypted chat, encrypted VoIP. (U) IPSEC -- IPSec, or IP Security, is the Internet Engineering Task Force (IETF) standard for layer 3 real-time communication security. IPSec allows two hosts (or two gateways) to establish a secure connection, sometimes called a tunnel. All traffic is protected at the network layer. (U) SSL – Secure Sockets Layer. Commonly used to provide secure network communication. Widely used on the internet to provide secure web browsing, webmail, instant messaging, electronic commerce, etc. (U) TLS – Transport Layer Security. The follow-on to SSL, SSLv3 and TLSv1.0 are nearly identical. (U) VoIP – Voice over Internet Protocol. A general term for the using IP networks to make voice phone calls. The application layer protocol can be standards-based (e.g., H.323, SIP), or proprietary (e.g., Skype). (U) VPN – Virtual Private Network. A private network that makes use of the public telecommunications infrastructure, maintaining privacy via the use of a tunneling protocol and security procedures that typically include encryption. Common protocols include IPSEC and PPTP. Penetrating Target Defences is the code-cracking group within Britain’s Government Communications Headquarters, or GCHQ. In 2000, the N.S.A. mounted a full-scale effort to preserve its access to the Internet. The agency deployed the world’s fastest computers to break codes and began collaborating with technology companies in the United States and abroad to build access points into their products. Three years ago, the N.S.A. gained the capability to decrypt vast amounts of scrambled Internet data. The full extent of the N.S.A.’s decoding capabilities is known only to a limited group of top analysts from the N.S.A. and its counterparts in Britain, Canada, Australia and New Zealand (the so-called Five Eyes group). Only they are cleared for the Bullrun program, the successor to one called Manassas — both names of American Civil War battles. The corresponding counterencryption program at GCHQ is Edgehill, named for the first battle of the English Civil War. The agency has circumvented or cracked much of the encryption that guards global commerce and banking systems, protects sensitive data like trade secrets and medical records, and automatically secures basic Internet communications, including the e-mails, Web searches, Internet chats and phone calls of millions of Americans and others around the world. Unlike some classified information that can be parceled out on a strict “need to know” basis, the Bullrun program is so secret that, in general, there will be no need to know. Only a small cadre of contractors were allowed to join Bullrun. It does not appear that Edward J. Snowden had access, but he managed to gain access to dozens of classified documents mentioning Bullrun. AUSCANZUKUS EYES stands for Australia, Canada, New Zealand, United Kingdom and United States, i.e., Five Eyes.